Build your own MIDI instruments. Easy as pie, impressive on stage. MidiMidi + MaKey MaKey = Your own MIDI controller without soldering. Have you ever dreamed about building your own MIDI controller / drumkit / instrument but weren't sure about all the technical stuff? With MidiMidi (software) and MaKey MaKey (hardware) it's entirely possible to build your own gear within minutes - and without any soldering. If you know how to plug in a USB device you are ready to go. Connect anything conductive - coins, fruits, metal, people - to your computer and play chords or melodies. How about adding sound FX notes to your guitar? Or controlling a DAW directly from your drum kit? Give your crowd something to talk about. Want to controll cutoff and resonance with bananas? Now you can! Integrate sounds and sound effects into your show. Or let your visitors shape the sound of your exhibition. Hint: You can test MidiMidi even without MaKey MaKey by using your normal keyboard. MidiMidi (software) and the Kickstarter funded hardware MaKey MaKey are the dream team to build or prototype DIY MIDI instruments the easy way. But how can these key presses be used for making music? This is where MidiMidi comes into play! MidiMidi converts the keyboard messages into MIDI notes or MIDI controller data. MidiMidi supports the same "keys" as MaKey MaKey out of the box (MaKey MaKey doesn't support the whole character set of a standard keyboard, it can only generate these keys: W, A, S, D, F, G, left, right, up, down, space). Just start the software and assign different MIDI events to them. This is all it takes to build your first own controller! Set a channel and a controller (CC) number per key. Define separate CC values for key press and key release events. Activate the toggle mode to hold down the pad until you press the key again. Each key can trigger up to four separate MIDI notes. This way it's possible to play single notes as well as chords. You can choose different channels, instruments, and velocity values per key. It's also possible to toggle notes: Turn them on when you press them once, turn them off again when you hit them a second time. Perfect for drum loops. This way you can always play in key while you jam on your instrument! Buy MaKey MaKey at their website: http://makeymakey.com. Download MidiMidi, install it, start it. Connect one side of an alligator clip to the "earth" part of MaKey MaKey and the other side to yourself. Connect one side of an alligator clip to the "space" field of MaKey MaKey and the other side to a banana / a metal object / your mother in law / anything conductive. Now if you touch the object you should see the "space" pad in MidiMidi lighten up. Take a look at the settings and change the output device to something that works with your MIDI hardware or software. 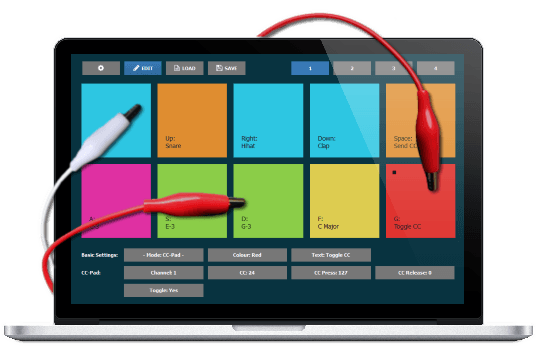 Use a virtual MIDI cable for Mac or Windows to send MIDI data to other software. Congratulations! You are ready to build the controller of your dreams now! I used the makey makey since a long time but was blocked in my experimentations because of the midi limitation. With midi midi I can realize my ideas ! Thank you so much ! Ben F.
I'm trying Midi Midi since few days, and that's really a nice software, it rocks solid and is very light for cpu and ram. Damien T.
Control other MIDI software and hardware with DIY devices! Create your own keymappings - turn your computer keyboard into a MIDI controller! 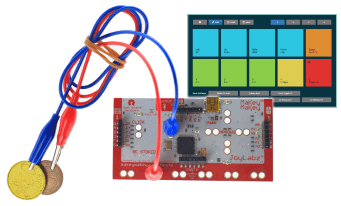 Please note: You will need to buy the hardware - MaKey MaKey Classic - separately! I use Share-it for sales. They offer many secure methods of payment including credit cards and PayPal. You will receive a serial via email with which you can unlock the demo once your offer is processed. Please note that there is no physical delivery and that you will have to buy MaKey MaKey (the hardware) separately.